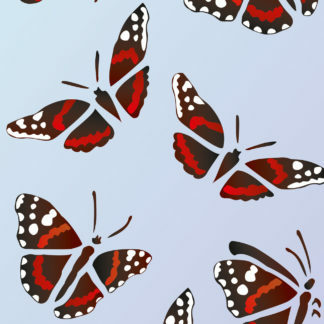 The Red Admiral Butterfly Stencils are two different sizes of beautiful true to life Red Admiral Butterfly motifs, both with two layer details of tiny wing markings and registration dots for easy alignment. 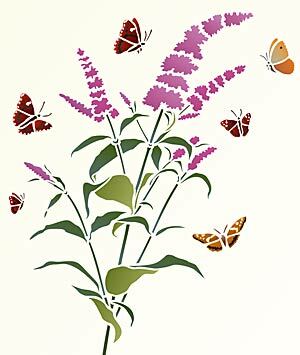 Red Admiral Butterflies Stencil 1 and Red Admiral Butterflies Stencil 2 complement many of our stencils, but particularly our stunning new Buddleia Butterfly Bush Stencil, Buddleia Stem Stencil and Little Buddleia Stencil. 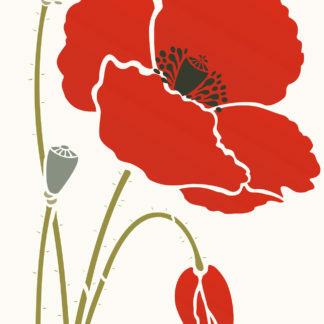 Fantastic for accessories, clothes, linens and on greetings cards. Size and layout specifications for each stencil detailed below. 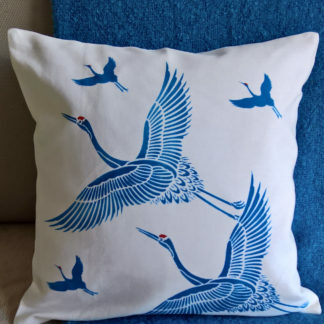 The stencils come with full instructions and we recommend our Stencil Sponges and one of our Artist’s Sable Brush Set for the layer 2 details. 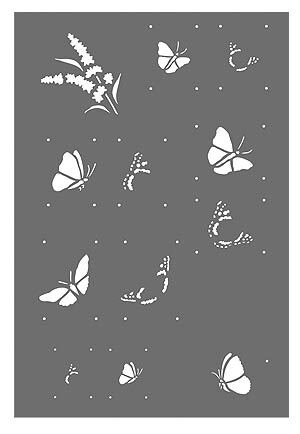 Red Admiral Butterflies Stencil 1 – comprises 5 red admiral butterflies in two different sizes, a cabbage white butterfly and a sprig of buddleia, on one sheet with registration dots for each red admiral butterfly motif. 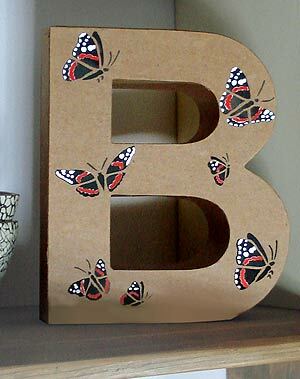 Above – the two layer details of Red Admiral Butterflies Stencil 1 make for very life-like butterflies! 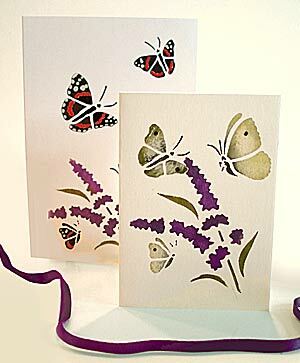 Gift card stencilled here in Jet Black Stencil Paint (layer 1) Ice White, Very Berry Stencil Paint (wing details) Indian Purple and Woodland Stencil Paints (buddleia sprig). 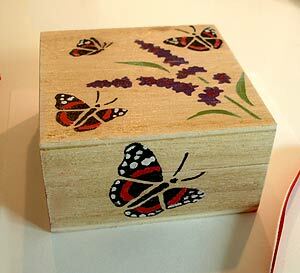 Above – use the Red Admiral Butterflies Stencil 1 to transform a plain wooden trinket box into a box to treasure! Stencilled with Jet Black Stencil Paint (layer 1), Ice White, Very Berry Stencil Paints (wing markings), Indian Purple and Ash Green Stencil Paints (buddleia sprig). 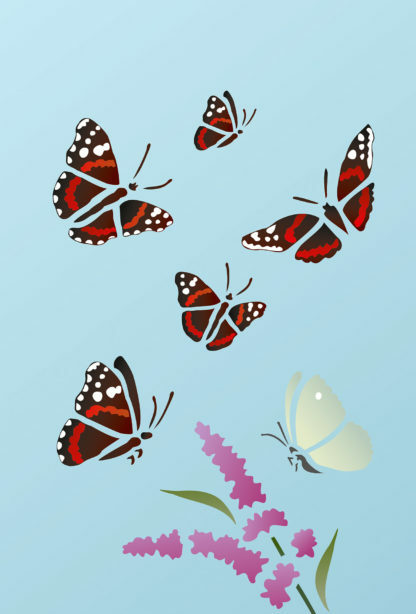 Above – the six butterfly motifs of the Red Admiral Butterflies Stencil 1 with the Buddleia Stem Stencil. 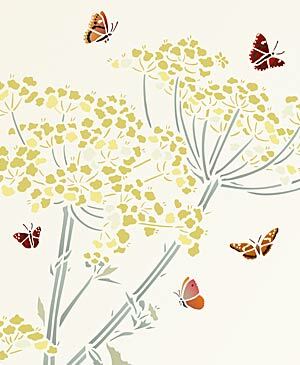 Above – Red Admiral Butterflies Stencil 1 shown with the Giant Hogweed Stencil. 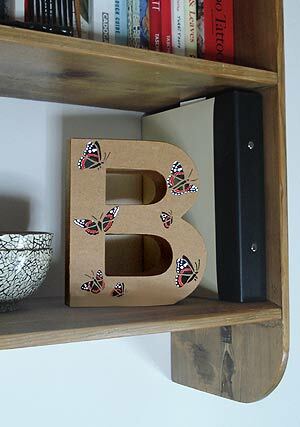 Above and below – the different butterfly motifs of the Red Admiral Stencil 1 are stencilled onto a papier mache ornamental letter ‘B’ – great for children’s rooms and studies! 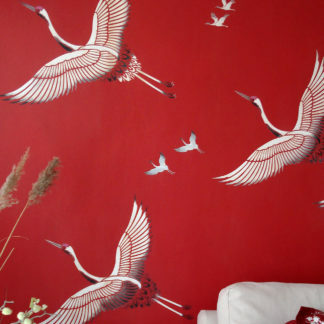 Above – the butterflies are stencilled in Jet Black Stencil Paint (layer 1 wings and body), Ice White and Very Berry Stencil Paint. 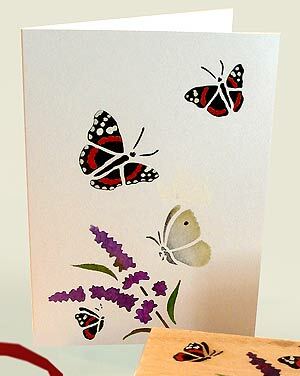 Above – Red Admiral Butterflies Stencil 1 is extremely versatile – great for creating a range of different gift cards. 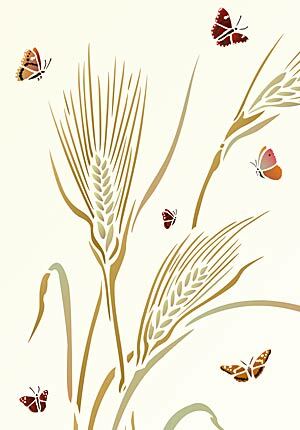 Above – the six butterfly motifs of Red Admiral Butterflies Stencil 1 shown in and around the Wild Rye Grass Stencil. 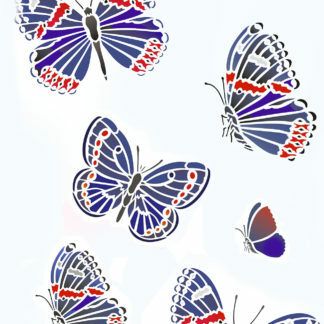 Above – all of the motifs of both Red Admiral Butterfly Stencils, showing the different sizes of the butterflies. The three largest butterflies are all part of Red Admiral Butterflies Stencil 2. 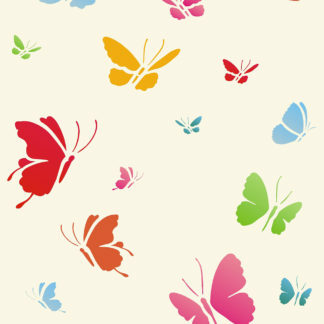 All other motifs are part of Red Admiral Butterflies Stencil 1. See specifications below. 5 different red admiral butterfly motifs in two sizes with registration dots for each butterfly for aligning detailed wing markings. Also additional cabbage white butterfly with dot wing marking. Small sprig of buddleia. 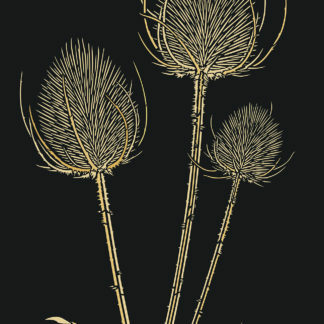 On one sheet of 125 micron Mylar. Largest/widest open-wing butterfly motif (2nd up bottom left below) is up to 5cm/2″ across wingspan. Largest butterfly in profile (under buddleia sprig) up to 2.6cm/1″ wide. 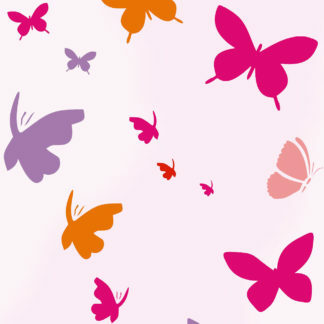 Small open-wing butterfly motif 2.7cm/1″ across wingspan (top right). Smallest butterfly in profile up to 1.7cm/.75″ wide (bottom left). Buddleia sprig up to 6cm/2.24″ high. Sheet size 21cm/8 1/4″ wide x 31cm/12″ deep. Illustrated below. 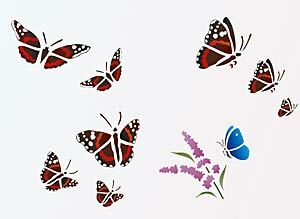 Left – stencil sheet of Red Admiral Butterflies Stencil 1.